The Illuminati gather to plan for the death of Everything. Infinity gems, old wounds, lies, agendas and universal incursions. 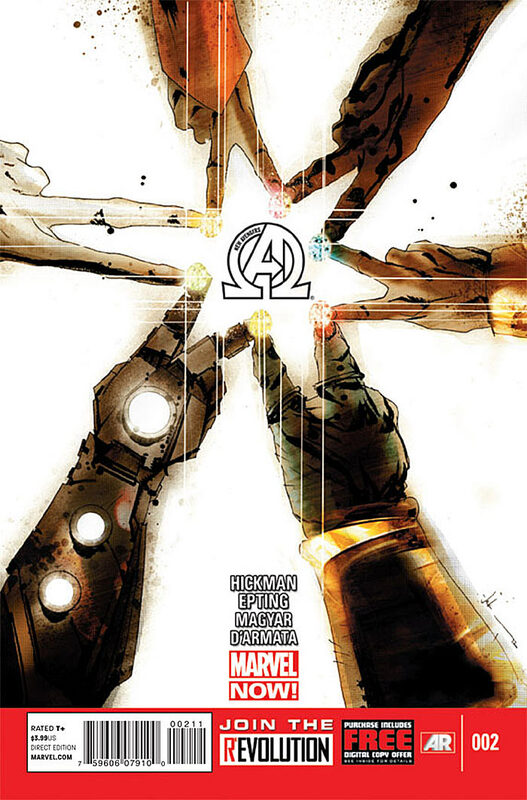 Cover- I love the standard cover, where all of the members of this new Illuminati’s fingers are all touching while the infinity gems glow at the points of intersection. Threat- I love how Hickman sells the level of this threat and the impending end of creation itself. It may have been exposition heavy but the illustrations combined with said exposition really sold the entire reason for this clandestine team up and the immediacy of the threat. Jonathan Hickman you and me in 2013 son! Sweet music together! Art-Steve Epting’s use of shadows really is the high point for the art despite the fact that his Namor looks like a hobo in need of a bath. Continuity– In my Last review New Avengers (2013) #1 I was left a bit, peeved that T’challa/Black Panther would have allowed Namor to walk back into Wakanda in light of his actions during Avengers Vs. X-men (See Avengers Vs X-men #8 and Avengers Vs. X-men #9 for details). Here Hickman quickly establishes that this is strictly business. To save creation itself he will tolerate Namor but when that is over he will kill him! That, my friends is more like it! Cover- Hated the alternate drawn by Simione Bianchi. Some find his art sent from heaven but it’s always hit and miss for me, and this one is a total miss! Action- Apart from a few what I’m assuming were flashes of the future this issue had no action to speak of. Exposition- Some may find this book not to their liking because it’s very exposition heavy.